Did you know that Americans waste nearly a pound of food per person each day? The exact amount of food we trash differs by how healthy your diet is, says a recent University of Vermont co-authored national study published inPLOS ONE. Between 2007 and 2014, U.S. consumers wasted nearly 150,000 tons of food per day - or nearly a pound of food per person each day. Researchers estimate that food waste corresponded with the use of 30 million acres of land annually and 4.2 trillion gallons of irrigation water each year. The amount of wasted food equals roughly 30 percent of the average daily calories consumed for every American - more than 320 million people. While most people want to eat better by putting more fruit and vegetables on their plates, the study found that higher quality diets were associated with higher levels of food waste. The study, by researchers at USDAs Agricultural Research Service, University of Vermont and University of New Hampshire, is the first to explore the links between diet quality, food waste and environment impacts. Twenty-two food groups were studied. Fruits, vegetables and mixed fruit and vegetable dishes - 39 percent - were wasted most followed by dairy - 17 percent - and meat and mixed meat dishes - 14 percent. Higher quality diets have greater amounts of fruits and vegetables, which are being wasted in greater quantities than other food, says co-author Meredith Niles, a University of Vermont assistant professor. Eating healthy is important, and brings many benefits, but as we pursue these diets, we must think much more consciously about food waste. The study also found that healthier diets used less cropland than lower quality diets, but led to greater waste in irrigation water and pesticides, which are used at higher rates on average for growing fruits and vegetables. Most existing research has looked at greenhouse gas emissions or land use and its link with different diets, Niles added. This study is the first to consider food waste as another important component of varying diet outcomes. The researchers estimated that consumer food waste corresponded to harvests produced with the use of 780 million pounds of pesticide and 1.8 billion pounds of nitrogen fertilizer annually. Both represent significant costs to the environment and the farmers who dedicate land and resources to producing food thats meant to be eaten. Education on preparing and storing fresh fruits and vegetables, and knowing the difference between abrasion and spoilage, is critical. Other policy efforts underway range from revising sell-by dates and labels for consistency, food planning and preparation education. Efforts to reduce food waste include French grocer Intermarchs inglorious fruits and vegetables campaign, which promotes the cooking of the disfigured eggplant, the ugly carrot, and other healthy, but otherwise superficially damaged produce. Food waste is an issue that plays out at many different levels, says lead author Zach Conrad at the ARS Grand Forks Human Nutrition Research Center. Looking at them holistically will become increasingly important to finding sustainable ways of meeting the needs of a growing world population. To investigate the impact of diet quality on food waste and environmental sustainability, researchers collected data on food intake and diet quality from the 2015 Healthy Eating Index and USDAs What We Eat in America database as well as available food waste data. The researchers calculated the amount of cropland used to produce wasted food using a biophysical simulation model. Using data from various U.S. government sources, the researchers estimated the amount of agricultural inputs, including irrigation water, pesticides and fertilizers used to produce uneaten food. While low-quality diets may produce less food waste, they come with a range of negative impacts, researchers say. This includes low nutritional value and higher rates of cropland wasted. The study notes that several countries, including Brazil, Germany, Sweden, and Qatar, have adopted dietary guidelines that incorporate environmental sustainability, but none include food waste as a factor. 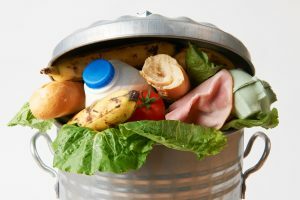 In another study, researchers at the Johns Hopkins Bloomberg School of Public Healths Center for a Livable Future calculated the nutritional value of food wasted in the U.S. at the retail and consumer levels. They shined a light on just how much protein, fiber and other important nutrients end up in the landfill in a single year. These lost nutrients are important for healthy diets, and some, including dietary fiber, calcium, potassium and vitamin D, are currently consumed below recommended levels. Nutrient-dense foods like fruits, vegetables, seafood and dairy products are wasted at disproportionately high rates. Previous research estimated that as much as 40 percent of food is wasted nationally, but it wasnt clear before this study how nutritious that food was. While not all wasted food is consumable, a sizeable amount is, leaving researchers and policymakers looking for ways to minimize the amount of good food that gets tossed as millions of Americans go hungry, do not get enough nutrients or do not have access to healthy food options. The U.S. Department of Agriculture and Environmental Protection Agency have set a goal of reducing food waste by 50 percent by 2030. Huge quantities of nutritious food end up in landfills instead of meeting Americans dietary needs, says study lead author Marie Spiker, MSPH, RD. Our findings illustrate how food waste exists alongside inadequate intake of many nutrients. The researchers calculated the nutritional value of the retail and consumer-level food waste of 213 commodities in 2012, using data from the USDAs Loss-Adjusted Food Availability data series. The research team, looking at 27 nutrients in all, found that food wasted in the U.S. food supply that year contained 1,217 calories, 33 grams of protein, 5.9 grams of dietary fiber, 1.7 micrograms of vitamin D, 286 milligrams calcium and 880 milligrams potassium per person, per day. The study also highlights how the amount of nutrients lost to waste compares to nutritional deficits in the typical American diet. For example, dietary fiber is important for maintaining digestive health and is found in grains, vegetables and fruits. Researchers estimate that, in 2012, food wasted each day contained upwards of 1.8 billion grams of dietary fiber, which is comparable to the full recommended intake for dietary fiber for 73.6 million adult women. American women under-consumed dietary fiber by 8.9 grams per day in 2012. The study found that the daily amount of wasted dietary fiber is equivalent to the amount needed to fill this nutritional gap for as many as 206.6 million adult women. Many factors contribute to food waste at both the retail and consumer levels, including the disposal of food due to aesthetic standards, large portion sizes, and management of perishables in fridges and pantries. There is currently great energy around efforts to address waste of food. Preventing waste at the source is considered to be the optimal approach. Strengthening food recovery efforts that bring surplus food to food banks and pantries is also an important area of effort, innovation and impact. This study offers us new ways of appreciating the value of wasted food, says Roni Neff, Ph.D., an assistant professor in the Bloomberg Schools Department of Environmental Health and Engineering who oversaw the study and directs the CLFs Food System Sustainability & Public Health Program. While not all food that is wasted could or should be recovered, it reminds us that we are dumping a great deal of high quality, nutritious food that people could be enjoying. We should keep in mind that while food recovery efforts are valuable, food recovery doesnt get to the heart of either the food insecurity problem or the waste problem. We need strategies addressing these challenges at multiple levels. The biggest waste of food produced for human consumption may be through dietary choices that result in the squandering of environmental resources. In a study published in theProceedings of the National Academy of Sciences, researchers at the Weizmann Institute of Science and their colleagues have found a novel way to define and quantify this second type of wastage. The scientists have called it "opportunity food loss," a term inspired by the "opportunity cost" concept in economics, which refers to the cost of choosing a particular alternative over better options. Opportunity food loss stems from using agricultural land to produce animal-based food instead of nutritionally comparable plant-based alternatives. The researchers report that in the United States alone, avoiding opportunity food loss - replacing all animal-based items with edible crops for human consumption - would add enough food to feed 350 million additional people with the same land resources. "Our analysis has shown that favoring a plant-based diet can potentially yield more food than eliminating all the conventionally defined causes of food loss," says lead author Dr. Alon Shepon. The scientists compared the resources needed to produce five major categories of animal-based food - beef, pork, dairy, poultry and eggs - with the resources required to grow edible crops of similar nutritional value in terms of protein, calorie and micronutrients. They found that plant-based replacements could produce two to 20-fold more protein per acre. The most dramatic results were obtained for beef. The researchers compared it with a mix of crops - soya, potatoes, cane sugar, peanuts and garlic - that deliver a similar nutritional profile when taken together in the right proportions. The land area that could produce 100 grams of protein from these crops would yield only four grams of edible protein from beef. Using agricultural land for producing beef instead of replacement crops results in an opportunity food loss of 96 grams - a loss of 96 percent per unit of land. This means that the potential gain from diverting agricultural land from beef to plant-based foods for human consumption would be enormous. The estimated losses from failing to replace other animal-based foods with nutritionally similar crops were also huge: 90 percent for pork, 75 percent for dairy, 50 percent for poultry and 40 percent for eggs - higher than all conventional food losses combined. Opportunity food loss must be taken into account if we want to make dietary choices enhancing global food security.